WEST PALM BEACH, Fla. (March 4, 2019) – Discover The Palm Beaches (DTPB), the tourism marketing organization for Palm Beach County, and iconic resort lifestyle fashion brand Lilly Pulitzer have partnered to create the first-of-its-kind, persona-driven travel guides to The Palm Beaches. The travel guides, titled “The Lilly Pulitzer Guide to The Palm Beaches,” will include purchasable style recommendations from Lilly Pulitzer. This engaging storytelling tool presents an interactive way to connect both brands and the customers who love them, while providing a digitally-immersive glance into the tropical lifestyle of The Palm Beaches and Lilly Pulitzer. A content-rich section of ThePalmBeaches.com was created to highlight ideas for Lilly Pulitzer-inspired things to see and do—where to eat, shop and stay—in The Palm Beaches. To highlight the diversity of experiences available in the region, four “travel personas” were created: The Jetsetter (stylish and cultured), The Beach Lover (relaxed and casual), The Luxe Traveler (elegant and refined), and The Adventurer (active and ambitious). DTPB and Lilly Pulitzer collaborated with a locally-based travel writer to design itinerary recommendations for each persona’s interests, and Lilly’s design team curated suggested fashions to wear while enjoying the corresponding “Must-Have Experiences.” Now, web users can navigate between the four travel personas with recommended activities and purchasable (or inspirational) wardrobe suggestions – some of which are a first for Lilly Pulitzer, including apparel from its new swim and golf lines. When selecting the apparel, Lilly Pulitzer’s team of fashion experts pulled items that are fun and functional for each travel persona. After all, bright, colorful hues with “happy” prints are inherently suitable in The Palm Beaches, no matter the season. 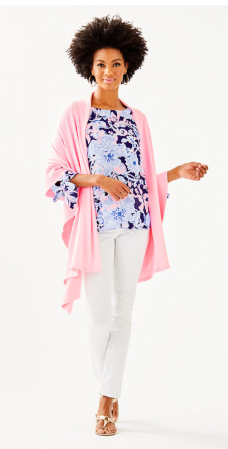 For The Jetsetter, transitional items appropriate from the plane direct to the museum were essential, starting with the white sateen Worth Skinny Jean paired with the Langston Top, a vibrant, breezy woven blouse, draped with the lightweight Marcelle Wrap (all shown). The Beach Lover's selections include polished ensembles perfect for the pool, beach or basking in the sun with either the sporty Azalea (shown) or Begonia one-piece swimsuits, paired with either the chic Wilda sarong, a ruffled midi with sheer-white leaf jacquard, or the Ginette coverup, a colorful chiffon poncho with fringe details. For the traveler wanting to exude playfully refined elegance, some of the recommendations for The Luxe Traveler include the fit-and-flare Mira Midi Stretch Shirtdress, the Pearl Soft Shift Dress adorned with a gold Lilly Lace neck piece (shown), and the metallic-combed Valiente Wrap for a subtle sparkle. Luxletic selections were vital to the functionality of the ready-foranything experiences to be had by The Adventurer, which is why the effortlessly stylish Skipper Popover with Weekender Midi Leggings (shown) made the list, along with two items from the label’s new golf collection – the Martina, a classic Meryl nylon sleeveless polo with ruffle detail, and the Daphne Golf Skort with lace detail. The partnership debuts at the launch of Lilly Pulitzer’s latest swim and golf styles, which are part of the Spring 2019 collection, and overlaps with the time of year that many visitors and locals enjoy the outdoor sporting events and activities available in The Palm Beaches. To reach both intended audiences, materials will be communicated through each brand’s owned channels, including social media, email marketing and brand websites. The guide is the first project of many between the two brands. The Palm Beaches, which is the collection of 39 cities and towns that make up Palm Beach County, are located in Southeast Florida – just one hour north of Miami and roughly two hours southeast of Orlando. While this destination’s rich culture is shaped by its storied legacy in the glittering Gilded Age, The Palm Beaches walk a delicate balance of preserving its meticulously adorned, bougainvillea-draped architecture with a bustling, urban vibrancy of its continued evolution. One thing that has remained the same for more than 120 years – travelers can always look forward to 47 miles of palm-tree lined, golden-sand beaches along the warm waters of the Atlantic Ocean. Founded in 1959, Lilly Pulitzer is currently celebrating a 60th anniversary year themed “For the Love of Lilly” and celebrates six decades of Lilly’s Palm Beach, print, and the inspiring community of Lilly lovers who bring it to life. Discover The Palm Beaches, formerly the Palm Beach County Convention and Visitors Bureau, is the official 501(c)(6) not-for-profit tourism marketing organization that promotes the collection of 39 cities and towns commonly referred to as “The Palm Beaches,” which spans more than 2,300 square miles and 47 miles of pristine, golden beaches from Boca Raton to Jupiter and Tequesta. Tourism is among Palm Beach County’s major industries, generating $4.7 billion in direct visitor spending and supporting 70,000 jobs with an economic impact of about $7 billion. Once recognized as a tropical escape for elite travelers in the late 1800s, America’s First Resort Destination® is making its resurgence as The Best Way To Experience Florida®, welcoming a record-breaking 8.02 million people in 2018. The Palm Beaches are home to nearly 17,000 hotel rooms, ranging from historic resorts to boutique inns. The destination features more than 100 family-friendly attractions, world-class luxury and antique shopping experiences, 125 miles of peaceful waterways for on- or in-the-water activities, 160 artificial reefs that line the Atlantic Ocean’s Gulf Stream current, 160 golf courses, award-winning restaurants and a thriving entertainment scene boasting more than 200 art and culture organizations. Situated along I-95, The Palm Beaches are also home to Palm Beach International Airport (PBI), with more than 200 daily direct flights to 27 domestic and international destinations in the United States and Canada. The Palm Beaches are also conveniently located next to Fort Lauderdale-Hollywood and Miami International airports, each one only an hour away. In addition, with the Virgin Trains USA (formerly known as Brightline), transportation into The Palm Beaches from Fort Lauderdale and Miami is even faster and more convenient – with an additional connection to Orlando coming soon. Lilly Pulitzer speaks to generations of rule-breaking, sun-followers who celebrate the spontaneous bohemian spirit of Lilly Pulitzer. The company’s effortless fashions are truly born from an original. It all happened by accident, when in 1959-ish Lilly (McKim) Pulitzer—a stylish Palm Beach hostess and socialite whose husband Peter Pulitzer owned several Florida citrus groves—needed a project of her own. With Peter’s produce, she opened a juice stand on Via Mizner, just off Worth Avenue in Palm Beach. Lilly Pulitzer’s business was a hit, but squeezing oranges, lemons, limes, and pink grapefruit made a mess of her clothes. Realizing that she needed a juice stand uniform, Lilly asked her dressmaker to design a dress that would camouflage the stains. The result? A comfortable sleeveless shift dress made of bright, colorful printed cotton in pink, green, yellow and orange. Although her customers liked Lilly’s juice, they loved her shift dresses. Soon Lilly was selling more shift dresses than juice, so she decided to stop squeezing and focus on designing and selling her “Lillys.” Lilly Pulitzer became a fashion sensation and a creator of authentic American resort wear as we know it. The brand is celebrating its 60th anniversary year and continues to create authentic printed styles straight from the in-house print design studio. For more brand history and juicy stories, head to lillypulitzer.com.